I am always looking to expand my knowledge! This year my focus is going to be on essential oils in general. I am even wanting to look into aromatherapy classes this year. I have not decided what classes I am going to take so here are some books I recommend, and some I have not yet read, but I am getting ready to! I will write up my review once I have it! I look forward to updating this page as I have read the books, and as I find more books! All of my added comments will be found in blue. Find out what I think after I read it! In Young Living, this is the most recommended reference book! 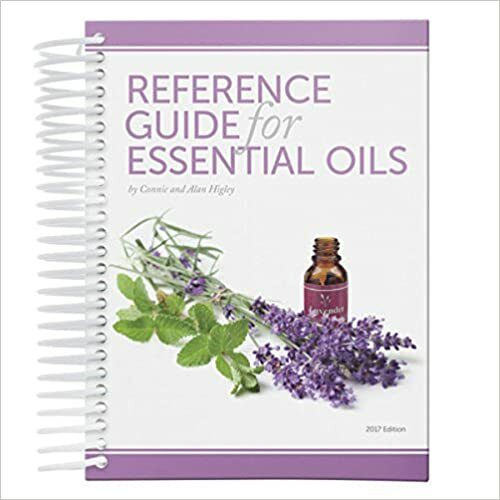 Reference Guide for Essential Oils, 2017 Edition I can not tell you how you how excited I was to get this book! Essential Oils for a healthier life! Essential Oils For Weight Loss: Your Guide To Kickstart Your Weight Loss With Essential Oils (weight loss strategies, weight loss tips) (Volume 1) I loved this book! I got the ebook copy of it, and I do not see that offered any longer but I really did learn a lot from this book! I knew Lemon, Peppermint, and Grapefruit were great for weight management, but this taught me beyond those 3 oils! Oil Pulling: Oil Pulling Therapy- Detoxify, Heal & Transform your Body through Oil Pulling (Natural Remedies, Oil Pulling, Oral Health, Coconut Oil, Oral Cleansing) This book was okay but I am not sure I am sold on oil pulling. If you want to learn more this is a great place to start. Essential Oils for Dogs: Natural Remedies and Natural Dog Care Made Easy: Includes Essential Oils for Puppies and K9’s This is a good starting point for essential oils and pets, but I would not call this a reference book. 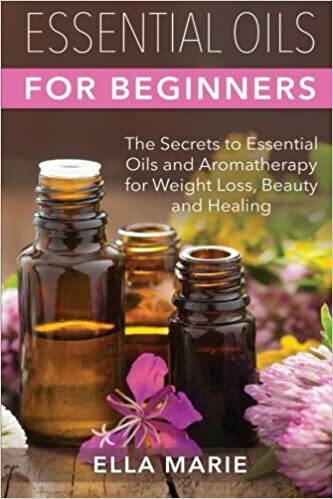 Essential Oils For Beginners: The Little Known Secrets to Essential Oils and Aromatherapy for Weight Loss, Beauty and Healing I am only halfway through this book and I am very happy with it! This is great for a beginner and someone who wants to learn more about essential oils. Pull out pen and paper you will want to take notes! Container Gardening For Dummies I bought a hard copy of this. I have not read it cover to cover yet, but I do love what I have read! How to Grow Potatoes: Planting and Harvesting Organic Food From Your Patio, Rooftop, Balcony, or Backyard Garden (Booklet) I bought the Kindle version of this book. This book is for people who have never grow potatoes before. (That was me!) This book also has the plans for a great potato box. I think that is the box we are using this year too! Young Living as a career! Getting Noticed: A No-Nonsense Guide to Standing Out and Selling More for Mompreneurs Who ‘Ain’t Got Time for That Are you already a member of Young Living? Are you looking to grow? This book was written by the head of the Lemon Dropper team! If you don’t already know, we pretty much rock! I have not bought this yet, but I am getting it VERY soon! The Obstacle Is the Way: The Timeless Art of Turning Trials into Triumph This book is recommended highly and I will have to order it as well! Essential Oils: A Beginner’s Guide Revealing the Power of Essential Oils This book was not bad. It uses the British method of essential oils and I have different thoughts on that. (British says no internal use) Other than that is has some good basic info and good info for use of essential oils in beauty. I think I got a copy that was two books in one, and I was way less interested in the second book. Aromatherapy and Essential Oils: A Beginners Guide (Lifestyle Guides Book 6) This book was not bad, at times it is a little overwhelming. It is worth the price if you can not afford a more complete book. Personally, I would save up and get a guide. ESSENTIAL OILS:: Essential oils and Aromatherapy Healthy Recipes Guide for Weight Loss, Healing and Beauty (Essential Oils for Beginners, Healing, Stress Relief, Aromatherapy for all Occasions) This was a lot like any other beginner guides. It has good safety warnings, and great carrier oil info but past that the recipes are pretty average and the info about the oils is limited. Essential Oils: A Guide to Using Essential Oils for Stress Reduction, Aromatherapy and Personal Care Pretty much like the other really basic books but it does touch briefly on essential oils and children. The other books do not even bring this up. I think this may also be a British Method book but I am not sure. One thing that bothered me is that it says to add oil to bath water. Oil and water don’t mix, you need a bath salt or something to mix with a bath. Books I have but have not read yet! Please note I have not read these yet, I can not say how good or bad they are yet, I honestly hope they are all good. I will update this as I read them! #GIRLBOSS I have not bought this yet but high on my maybe list! Homemade Body Sugar Scrubs: Quick and Easy recipes that are natural, healthy and additive free! 10 Essential Oils That Gave Me Freedom: How To Use Them And My Personal Story! (18 Non-Toxic Cleaning Recipes To Go Chemical-Free with Essential Oils Book 2) This turned out to be a big sales pitch for doTerra. 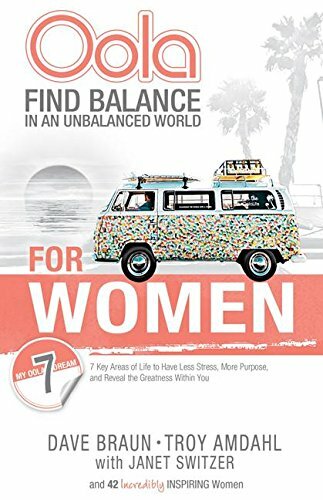 I would like to point out I do not have a problem with doTerra but I am not happy that this book is $2.99 for something you can learn for free on many blogs or an oil 101. Essential Oils: A Guide to Improving Your Mental Well-Being with Essential Oils Over priced for VERY basic info. This one is not worth your time or money. I recently have learned just how out of shape I am. My whole body hurts and my muscles ache. I tend to react better to warming pain relief than cooling pain relief. Most pain creams and oils have wintergreen and that is one I do not care for. I wanted something that was warming, I can use Panaway later if I need cooling relief. So I started searching the web, and I found several recipes I like, and because I can never just make a recipe the way it is written I have cobbled together this one and giving it a test! I may tweak this later, because I do not have one of the oils, and I need balm like today. I am totally adding Juniper to my next order! Optional: Some wintergreen (maybe 5 drops). Wintergreen is an oil you have to be careful with so before you add it, be sure you read up on it or are familiar with it. Variation: Add extra beeswax to make a bar. I plan on trying this once I am happy with the oil mix ratio. I am not sure how much yet but if you have made lotion bars you may be able to wing it! A word of warning: coconut oil has a VERY low smoking point, and you do not want to breathe the fumes from cayenne pepper. I recommend using a facemask, or you will be pepper spraying yourself. Over a very low heat or in a double broiler heat the coconut oil and cayenne. You want to use a non-porous pan. I prefer glass pans and metal utensils. You will want to stir this the whole time. The cayenne will try tp stick to the pan, and that is something you will want to prevent. Do not let it smoke, heat the mix over the lowest heat possible. Once the oil changes color (took about 20-30 minutes) add the beeswax and shea butter. Once these have fully melted remove from heat and let it cool until no longer hot to the touch. Once the mix is mostly cooled add the essential oils. You do not want the mix hot when you add the oils, you can even wait until it is fully cooled to add the oils. I could not wait for it to go solid to try it. I am tons of pain right now, so I tried it right away. This is my new workout buddy! I use only cosmetic quality shea butter and wax. The links above are the same products I buy. (Links also Amazon affiliate links.) I am not super experienced in making lotions and stuff but I have made some. Every recipe I read say to use cosmetic grade, and I have no reason to question that. I recommend the same. This is is also why I use Young Living. You are welcome to use any oils you prefer, but be sure of the quality. There are other high-quality oils but I stick to the Seed to Seal Promise! If you would like to know more book an Oil 101 class and follow me on Facebook! I found this AMAZING recipe! That I will be sharing in the group. You are lucky my blog readers to see it here before them! There is a whole lot you are missing, though, so you may want to think about joining! Young Living offers a lot of great stuff, but they don’t offer everything I need for an Oily Lifestyle. When I first joined Young Living, someone told me, “Don’t buy bottles, soon enough you will have too many.” This is great advice! You can easily recycle your old bottles. Mix your own favorite blend in an old bottle or fill up a smaller bottle to carry around with you. Want to make your own roller bottle of something? 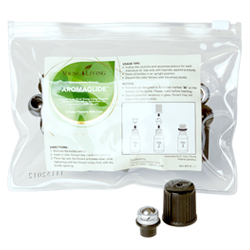 Add the AromaGlide tops from Young Living to one of your old bottles! These Wholesale at less than $10 for 10 so it is a great deal! 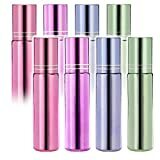 If you do want to buy roller bottles, there is a lot of great options on Amazon. They even come in lots of Fun Colors! I make a lot of household cleaners, and even a flea spray for the pets. I went and bought a spray bottle for these, only to learn after that, not to use plastic! So now I recycle my old vinegar bottles for my cleaners. I asked my friends who still use store bought cleaners (Why would they still use that crap…) for the sprayer heads. It fits a vinegar bottle PERFECT! Can you tell I tend to reuse a lot of stuff? If you want to buy spray bottles I suggest these big 16oz Amber ones! I do need some smaller spray bottles to carry in my bag, and for kids to use. I am looking at these Amber 2oz ones and Cobalt ones. Want to make some really fun stuff? Do you dream of making your own Bath Bombs, Lip balm, and NonToxic deodorant? Want Creamy lotions and soaps? Silicone molds for shaping your stuff! And Containers to put all of that in! 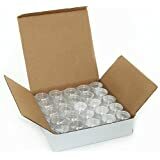 50 Lip Balm for only $10!!!!! !